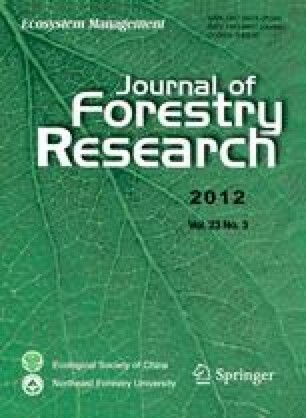 We evaluated the effects of planting densities (500, 1,000, 1,500 and 2,000 trees·ha−1) on tree growth performance (diameter at base, diameter at breast height, and clear bole height) of two clones (RRIM 2020 and RRIM 2025) of nine years old plantations of rubber tree (Hevea brasiliensis Muell. Arg) in Malaysia. For the four planting densities of the two clones, basal area and diameter at breast height declined with increasing planting density. Clear bole heights were greatest at 1,500 trees·ha−1 and lowest at 500 trees·ha−1 for the clone RRIM 2020, and at 2,000 trees·ha−1 and 500 trees·ha−1 for clone RRIM 2025. We conclude that the ideal planting density is 2,000 trees·ha−1 for obtaining high volume of wood production and 500 trees·ha−1 for high wood quality.